Imagine being the only parent you know whose child has a feeding tube and a tracheotomy. Now imagine how comforting it would be to sit down with one other mom or dad who understands what you’re going through. How about if there were dozens of other parents who get it? Suddenly you don’t feel so alone. The FOCUS (Families of Children Under Stress) story began in 1983 when two parents of medically fragile children met at a children’s hospital. Their children had no specific diagnosis, and the parents could not find a support group. They became friends after that hospitalization, and, in each other, found comfort, information, and hope. Together, they founded FOCUS to help families cope with the overwhelming struggles of parenting a child with special needs. Executive Director Lucy Cusick and Associate Director Joy Trotti know what families need because they’ve been there. We sat down with Lucy and Joy to talk about their story and their mission and about how technology helps them achieve that mission. Lucy’s son was born with cerebral palsy. As the parent of a medically fragile child, she didn’t know parents of kids who had special needs and found that she didn’t identify with other new parents. She didn’t fit in the typical parent world and sought out like-minded families at FOCUS. Joy had her daughter in 1991 and became involved with FOCUS in much the same way that Lucy did. Her daughter’s needs were unlike those of others at the time. She came to FOCUS looking for other parents like her. It’s a tough and emotionally draining to be a parent of a medically fragile child, she says, but you learn to find joy in simple things. The smile of a child can be the thing that brings joy. Today, Lucy and Joy help bring comfort and peace of mind to families by providing support, resources, information, and friendships to families with medically fragile children. They offer community care programming–respite care, camps, share groups, workshops and more–that allow parents and kids to take a break from the stresses and medical issues they deal with daily. Part of what makes FOCUS work is its close connection with families. “Families want to feel like they belong with us,” say Lucy and Joy. Technology allows that to happen. “The database is an important way to keep track of clients’ needs and medical information.” And FOCUS camps and other programs can’t run if staff can’t immediately access emergency contact and care information. “A database feels ‘cold,'” say Lucy and Joy, “But that’s how we stay connected with families. Having access to data allows FOCUS to re-familiarize themselves with children and their needs before contacting families. FOCUS reached out to TechBridge when they realized they had pushed their old database to its limits. They were no longer able to make it do what they needed it to. We performed a technology assessment for FOCUS, and they’re currently working with us on a Salesforce implementation that’s almost complete. The new database will allow FOCUS to put more time into helping families and less time into wrangling data. Lucy and Joy want you to be aware that there are kids in the community with all kinds of needs. They’re launching a new PR campaign called, “I Dare You” that challenges the community to give comfort. To think about what it would be like if your child faced serious medical issues. To just do something. Give something. $100 goes a long way at FOCUS. 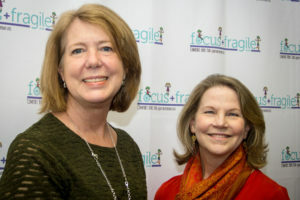 FOCUS is also looking forward to the FOCUS and Fragile Kids Golf Classic on May 22, which raises money to fund programs. We look forward to watching this amazing nonprofit grow and continue to demonstrate that we really are #BetterTogether. TechBridge is proud to have assisted so many organizations on the front lines of social change in our communities—alleviating homelessness, fighting poverty, helping kids do better in school, making sure seniors get proper meals, and so much more. We created the #BetterTogether campaign so that we can showcase some of the important efforts of the nonprofits and people we’ve worked with. And because social change is a community effort, we also wanted to showcase the generous sponsors, amazing technology partners and tireless volunteers and TechBridge staff who enable us to do the work that we do. We feel that these stories exemplify the transformational work that can happen when organizations and individuals work hard—together—towards a common goal. We hope that hearing these stories is as inspirational to you as it is to us. Inspired by the FOCUS story and how they worked with TechBridge to improve their ability to provide support, resources, information, and friendship for the families they serve? Let’s talk about how your nonprofit can do more good and improve more lives in the new year.